New $2 Mega Millions starts Oct. 28 with $40 million starting jackpots. 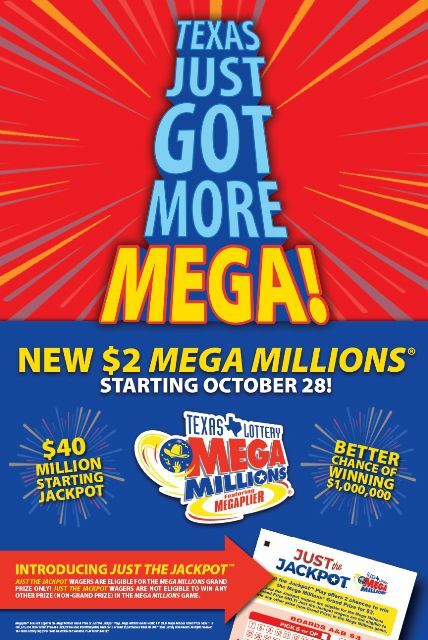 Beginning October 28, tickets will go on sale for a redesigned Mega Millions game with larger starting jackpots, faster rolls and better chances at winning the second-tier $1 million prize. Starting jackpots for the multi-state game will increase from $15 million to $40 million and ticket prices will increase from $1 to $2 per play, according to a Texas Lottery news release. The new game will also feature a new optional $3 wager, “Just the Jackpot,” which will allow players to receive two chances to win the game’s grand prize. “Just the Jackpot” prize wagers are only eligible to win the Mega Millions grand prize and are not eligible to win at other prize levels. In the redesigned game, players will select five numbers from one to 70, and one Mega Ball number from one to 25. Players will have a one in 24 overall chance of winning a prize. Mega Millions is one of the world’s biggest and most recognizable lottery games. Introduced as “The Big Game” in August 1996 with six member states, the game grew, becoming Mega Millions in May 2002. Texas joined the Mega Millions game in 2003 and has had 12 jackpot winners. In 2017, Texas has had seven second-tier winners of $1 million or more.